Paget disease (PD) is a bone disorder. 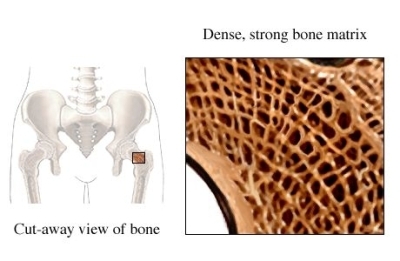 Normal bone is always being broken down and built again. With PD, bones are broken down too fast. New bone is loose and bulky instead of strong and compact. This leaves bones weak. They may bend over time. The exact cause of PD is not known. It may due to a viral infection, such as the measles. PD is more common in people who are over 55 years old. It usually occurs in people of European descent. Your doctor will order blood tests. It is best to start treatment as soon as you can. Talk with your doctor about the best plan for you. Use assistive devices, such as canes and shoe lifts. They can help you if you have a limb that is too short. There are no methods to prevent PD. People with close family members who have PD should screened for the SQSTM1 gene. Albagha OM, Genetic Determinants of Paget's Disease (GDPD) Consortium. Genome-wide association identifies three new susceptibility loci for Paget's disease of bone. Nat Genet. 2011;43(7):685-689. Michou L, Brown JP. Emerging strategies and therapies for treatment of Paget's disease of bone. Drug Des Devel Ther. 2011;5:225-239. Paget disease of bone. EBSCO DynaMed website. Available at: http://www.ebscohost.com/dynamed. Updated November 10, 2015. Accessed May 11, 2016. Schneider D, Hofmann MT, et al. Diagnosis and treatment of Paget's disease of bone. Am Fam Physician. 2002;15;65(10):2069-72. What is Paget's disease of bone? NIH Osteoporosis and Related Bone Diseases National Resource Center website. Available at: http://www.niams.nih.gov/Health%5FInfo/Bone/Pagets/pagets%5Fdisease%5Fff.asp. Updated November 2014. Accessed May 11, 2016.